Research has shown that deglycyrrhizinated licorice supports and promotes a healthy stomach lining and intestinal flora. 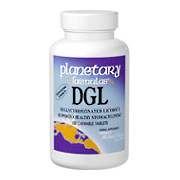 Planetary Formulas DGL is licorice from which the glycyrrhizinic and glycyrrhetinic acids have been removed. These acids are associated with high blood pressure. Professional strength DGL Licorice reflects the dosages and preparations used in clinical studies. Chew one tablet before each meal, or as recommended by your health care professional. Total Carbohydrates 1 g, Deglycyrrhizinated Licorice 380 mg, Root Extract (10:1). Other Ingredients: Sorbitol, mannitol, stearic acid, natural orange flavor, and magnesium stearate. DGL Licorice is shipped in a discrete, unmarked package. Orders are processed immediately and usually take about 3 to 5 working days to be received. We do ask that you try it for 2 to 3 weeks to feel the full effects. Any information received is used only for order processing and shipping purposes. Your information, such as e-mail address, will never be disclosed to a third party.